This month, we are taking a look at Latin@s in science fiction and fantasy. 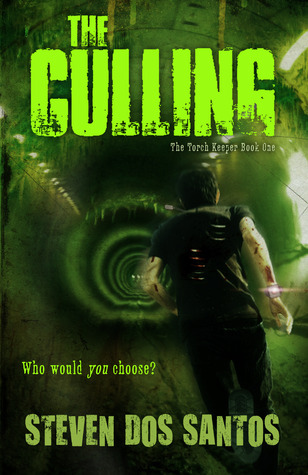 Today, we have a Q&A with Steven dos Santos, author of The Culling and The Sowing. 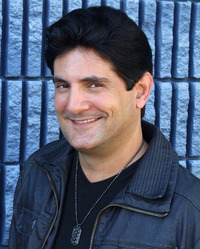 Born in New York City and raised in South Florida, Steven dos Santos began writing at age 7. It was only after a couple different career paths as an adult that he decided to become a professional writer. His trilogy, entitled The Torch Keeper, is his first effort. 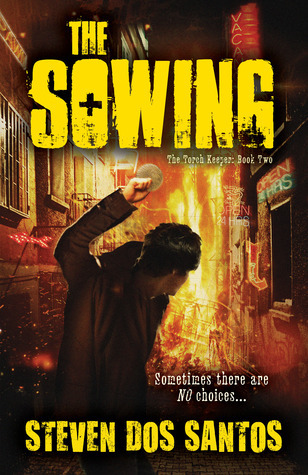 Book One, The Culling, was published last year, and the second book, The Sowing, was published in 2014. Steven was kind enough to answer a few questions for Latin@s in Kid Lit – among other things, about the rewards and struggles of his writing career and what’s in store for the future. Eileen: Could you tell us a bit about what prompted you to write this series? What is it about this genre that is appealing to you? Steven: I’ve always been a fan of sci-fi movies and books, particularly stories that deal with moral dilemmas. Ever since I was a kid I was always terrified by the idea of what would happen if I was in a situation where I could only save one person that I loved. Who would I choose? How would I choose in such an impossible situation? Writing The Culling gave me a chance to explore that no-win scenario and grapple with my own nightmares. Eileen: What kind of research do you do to create your books’ themes/characters/setting? Steven: For The Torch Keeper series, I found myself researching a lot of different things that probably raised a few eyebrows at the NSA! LOL. Everything from disarming explosive devices, the effects of hypothermia on the body, symptoms of terminal illnesses, the history and stats of the Statue of Liberty, humankind’s negative effects on the environment and potential harm it can create in the future, etc. Even though both The Culling and The Sowing have futuristic elements, I felt it was very important to ground them in reality in order to heighten the emotional effects. All the tech and post-apocalyptic devastation are based on things that could actually happen, which, in my opinion, not only raises the stakes, but definitely increases the tension. Eileen: Do you base your characters on people you know in real life? Would you say that Lucky is a reflection of yourself? Eileen: What are your thoughts on diversity in YA scifi/fantasy works? Is this an important issue for you personally? If so, how? Steven: This is an issue I’m very passionate about! While I think it’s great that there is definitely an increased awareness on the parts of readers and publishers alike regarding diversity in YA scifi/fantasy, I think we are only beginning to scratch the surface of this extremely important issue. Everyone deserves to see him or herself portrayed as the hero of a novel, the one to save the world. It’s also extremely important for young people to read about all types of people and realize just how much they have in common. Growing up, I wish there had been more books that included characters like me on their pages. This was definitely a big motivator in writing The Torch Keeper series. Eileen: Who or what has influenced you in your writing career? Do you feel that being a gay Latino influences your work? Steven: My mom was a definite inspiration in pursuing my writing dreams. I was brought up not only embracing my Hispanic heritage, but also to be proud of the country of my birth, America. I also definitely feel being part of a minority (or more than one in my case) has challenged me to strive for greater representation of diversity. But on those days when I’m feeling particularly frustrated, I read these messages I’ve received. Thanks for writing a great book and I hope it receives all of the attention it deserves. I know some people won’t pick up the book because it has gay characters. I try to plead with them because it is a great book. Love is love to me and everyone should be accepted for what they are and that’s the great thing about your book. Right now I’m struggling with my own sexuality, not really struggling because I know I am gay but my mother doesn’t accept them. You have inspired me though to try to come out. You have relieved some of the pressure. Thank you. I just really want to say thank you for your books because it’s really really awesome to see a novel with an openly queer protagonist on the shelf at Barnes and Noble and then read it and find that the book isn’t about the “struggles of being a queer teen” and instead created actual conflicts rather than people just being appalled by two boys being together and after I read The Culling I sat down and just cried because it’s so nice to feel validated and accepted especially if you live in a place where being accepted as anything other than heterosexual is unheard of so yeah thank you so so much for your books they’re incredible and I really really hope they affect other people like they affected me. And that is a magical reminder of why I do what I do. If I can reach just one person in such a powerful manner, I’ve accomplished something wonderful. That’s also why it meant so much to me when The Culling was recently named an American Library Association Rainbow List Top Ten Selection. Eileen: Have you experienced any roadblocks getting published? Or has it been fairly smooth sailing? Steven: I’ve definitely experienced obstacles on my road to publication. I actually had an agent put in writing that while she loved my book, she was going to have to pass because the market for YA books is heterosexual females and no one would want to read a book about a male protagonist, especially a gay male protagonist. To say I was crushed would be a grave understatement. This wasn’t a rejection of the quality of my writing, which I could improve if need be. This was far more insidious. It was a rejection of my being. Basically, the message was, no matter how good my writing was, no one was ever going to be interested if I wrote about a particular type of teen. If I wrote about people like me. Eileen: What are you working on now? Steven: I’m actually working on finishing the concluding novel in The Torch Keeper series! My goal is to finish it by the end of summer. I’ve already written the ending, which I pretty much envisioned while writing The Culling. I can’t say too much about it, but rest assured like The Culling and The Sowing, the title of Book 3 will also end in ING. (Hint: It’s NOT “The Reaping!”) I’ve also started work on an entirely new novel that is more in the horror genre and will once again feature a diverse cast. We’re thrilled to have you on the site! Any advice for new authors that are struggling to market diverse books in the YA genre?